Did you ever lose luggage while traveling by aeroplane? Did you ever have to go to the lost luggage depot of an airport? We get visitors very regularly here in Dubai. Once or twice it happened that their luggage was not on their plane. A day later it usually arrives and can be picked up in the Lost Luggage Depot. In the depot, suitcases are kept on huge shelves, put into order of airlines on which the lost bag was found or not picked up. The depot is so big that little tractors and forklifts have enough space to drive through. Upon arrival one is asked to follow the supervisor to the shelves of your particular airline. Then you have to give a description of your lost luggage and labels will be checked against. The procedure can take a while. But what's worse is the smell in this depot. It comes from the lost luggage. Have you ever wondered what people have in their suitcases when traveling? I do, every time I enter an airport. Especially here in Dubai where people come from all over the world. At Dubai International Airport you get to see any kind of luggage: regular suitcases and travel bags in all sizes, but also over-sized card board boxes, taped all the way round. Heavy-duty plastic bags, probably several layers, also taped together, with addresses written on them in huge letters with permanent markers, in the hope that piece of luggage will survive the journey. Woman from Britain brings 6 month supply of British chocolate upon return to Dubai. French woman brings French ham and cheeses (both quite critical when in lost luggage). Indian woman took frozen fish fingers, sliced cheese and fresh cherries back to India and returned with I dunno what fresh foods (all needed to be put straight in the freezer, that I know). And then there is us. From our holidays in Portugal we brought about 3kgs of salted air-dried codfish, an essential Portuguese ingredient in many of their specialties - also known as bacalhau) via Germany back to Dubai. While there is little chance that something dried goes off quickly, it still has distinct smell to it. Which can be kept under control when wrapped very tightly in many layers of plastic bags. But if a suitcase with 3kgs of dried fish gets lost and is never picked up for whatever reasons, as obviously happens to many of the suitcases in the Dubai Airport Lost Luggage Depot. I fell in love with bacalhau in Portugal. In fact, I fell in love with Portuguese food. So simple, straightforward, non-fussy, with just a handful of ingredients. Proper honest home fare, with lots of seafood. One of the first dishes that I tried to recreate was Arroz de Bacalhau. I refuse to translate this into English. It sounds much better in Portuguese (says me who doesn't speak more than a handful of Portuguese words). It's not a risotto, it's more simple rice with stirred-in codfish. I bet the word-for word translation of Arroz de Bacalhau is Rice with Codfish. 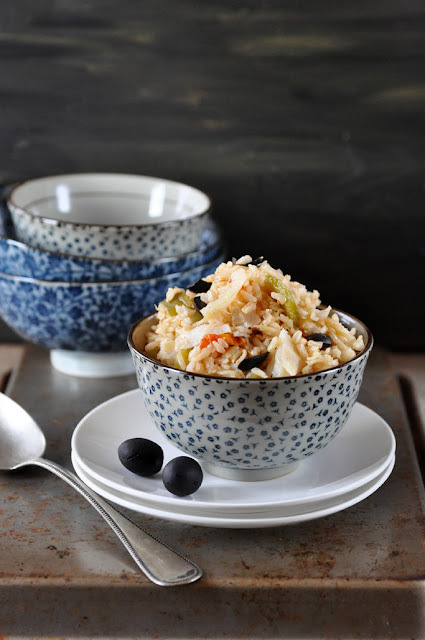 The dominant flavors and textures are salty codfish and in white wine cooked chewy brown rice with a little tomato. Add some black olives and you'll have the most satisfying dish that you can make from pantry staples. Enjoy. In a bowl, cover the bacalhau with water. Rehydrate for at least 12 hours. Drain and rinse the fish, then peel off the skin and remove bones. Flake into bite-sized pieces. Set aside. In a pan, heat one tablespoon of olive oil over medium heat. Add chopped tomatoes and fry for 2-3 minutes. Add green pepper and fry for another minute. Stir in brown rice, then add water and white wine. Cover with lid and cook over low heat, until rice is cooked and most liquid is absorbed. Meanwhile, heat the other one tablespoon olive oil over medium heat. Add the onions and fry until they become translucent. Add the bacalhau flakes and fry until cooked, about 4-5 minutes. Take off the heat and set aside. When the rice is done, stir in the bacalhau. Transfer to serving dish. Garnish with black olives and sprinkle with chopped parsley.